Contains: Polyscias, Osmoxylon, Hydrocotyle, Xanthosia, Trachymene, Panax. The Araliaceae are a family of plants found worldwide, with diversity particularly high in the tropics. The majority of Araliaceae are shrubs and trees, though the family also includes herbs and climbers. Recent phylogenetic studies have lead to the inclusion in the Araliaceae of the herbaceous Hydrocotyloideae, previously included in the Apiaceae. Members of this group include Hemiphues, a genus of small montane herbs with creeping stems forming compact patches and more or less fleshy leaves found in New Zealand and Tasmania (Allan 1961). Other representatives of Araliaceae in the woody climbers in the genus Hedera, the best known of which is the garden ivy Hedera helix. Panax, the ginsengs, is a genus of stout-rooted herbs that have become known for their supposed medicinal uses. The Asian ginseng P. ginseng has, due to overharvesting, become less commercially significant than the American P. quinquefolius. The type genus Aralia, the spikenards, includes species with bipinnate leaves found in Asia and the Americas, varying from herbs to trees. 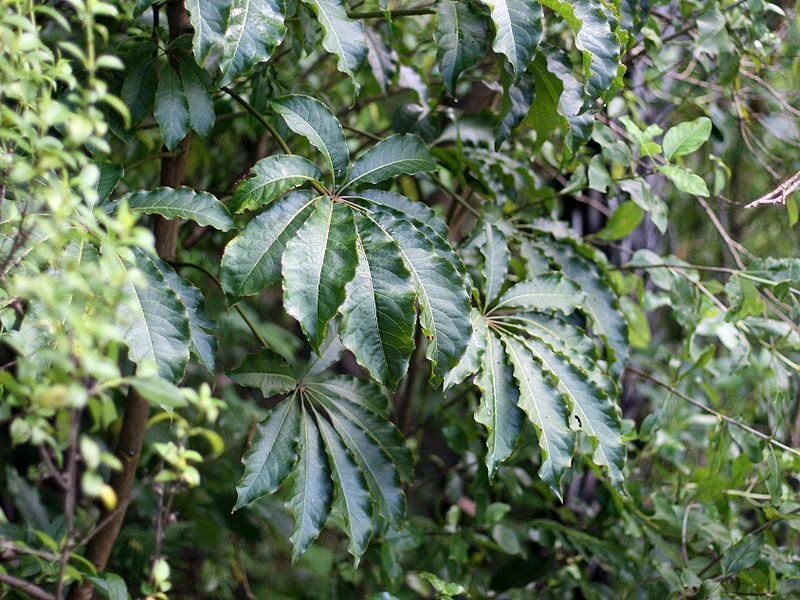 Schefflera includes trees, shrubs and lianas with palmately compound leaves. Pseudopanax, the lancewoods, is a genus of trees found primarily in New Zealand, notable because of the differences in habit between juveniles (with linear, pendent leaves) and adults (with broader, more erect leaves). See also: Ginseng and ivy. Characters (from Kårehed 2003): Mostly woody (sometimes herbaceous); leaves usually alternate (sometimes opposite or whorled), simple or compound, penninerved or palmatinerved, serrate or entire, domatia absent; stipules absent or present; petiole with or without sheathing base; stomata para-, aniso- or anomocytic; hypodermis present or absent. Inflorescences mostly simple umbels; flowers usually with articulated pedicels, unisexual or hermaphroditic, pentamerous (sometimes 3-12-merous, stamens and carpels sometimes twice that number or up to ca. 200), petals free (sometimes connate at base); petals single-veined; aestivation imbricate or valvate; disc present; style mostly with 3-4 free stylodia, sometimes connate into style; stylopodium mostly present; ovary inferior, 2-5-locular (occasionally plurilocular); fruit a drupe or berry. Chromosome number x=11-12+. Secretory canals present; nodes trilacunar (rarely unilacunar); perforation plates simple and/or scalariform; vessels mostly solitary or mainly in groups, sometimes with helical thickenings, with simple pits or pits with very narrow borders; axial parenchyma scanty, paratracheal; rays heterogeneous; fibres with simple pits, mostly septate. Pollen colporate; exine usually reticulate. [DVC08] Darbyshire, I., K. Vollesen & H. M. Chapman. 2008. A remarkable range disjunction recorded in Metarungia pubinervia (Acanthaceae). Kew Bulletin 63 (4): 613–615. [HH00] Hart, J. M., & M. J. Henwood. 2000. Systematics of the Xanthosia pilosa complex (Apiaceae: Hydrocotyloideae). Australian Systematic Botany 13 (2): 245–266. [H98] Heenan, P. B. 1998. The status of Raukaua edgerleyi var. serratus and R. × parvus comb. nov. New Zealand Journal of Botany 36: 307–310. [S62] Stone, B. C. 1962. Boerlagiodendron (Araliaceae) in eastern Melanesia. Proceedings of the Biological Society of Washington 75: 25–32. [SK02] Sumithramma, N., A. R. V. Kumar, K. Chandrashekara & D. Rajagopal. 2002. Plant selection for nesting by Oecophylla smaragdina, Hymenoptera: Formicidae: do physical features affect the choice of the plant? Journal of the Bombay Natural History Society 99 (3): 408–412.